Many forested landscapes throughout the world involve a mix of public forest ownerships. This study explores how coordinated planning between two large public ownerships in Minnesota impact landscape-level trade-offs between timber production and production of core area of older forest (COF) for the region. COF is an important metric for wildlife habitat. Emphasis is on better understanding potential gains from both coordinated planning at the site-level where ownerships share stand boundaries and from coordinated planning at a broader policy level involving assumed values of COF by the public. The study area involves over 300,000 ha, 150,000 analysis units and a 100-year planning horizon. The concept of influence zones in modeling spatial interdependencies is described and implemented. The estimated total area of COF is assumed an important landscape metric for forest wildlife habitat condition for each forest planning period. COF has a surrounding buffer protecting it from edge effects. Differences are recognized between COF condition requirements and condition requirements for its surrounding buffer. 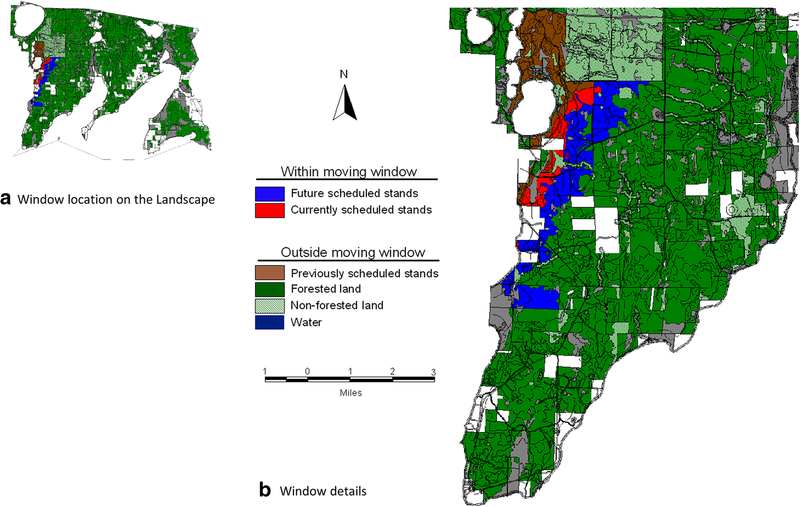 A spatially-explicit harvest scheduling model is applied in conjunction with moving-windows techniques of GIS to find near-optimal management schedules for the large landscape. Multiple model runs are examined to help better understand both potential gains from coordinated planning and the tradeoffs between timber and COF production. Results demonstrate the ability to incorporate detailed site-level COF production into management scheduling models for broad, landscape-level planning. For the study area and the assumed COF definitions, substantially larger gains are possible by coordinating COF value assumptions across ownerships, as compared to possible gains from coordinating on-the-ground management activities in areas involving shared stand boundaries. Although a general map of the study area shows a definite intertwining mosaic of ownership by the two large public agencies, a detailed breakdown of influence zone information shows that a low percentage of the land is influenced by both of these ownerships for COF production. This research helps illuminate potential large gains from coordinated planning at a broad policy level by large public ownerships through coordination of assumed COF values. For the study area, these gains are substantially greater than gains from combined modeling efforts addressing spatial detail and shared stand boundaries or neighborhoods. From a practical standpoint, this is important, as spatial detail adds substantially to model size, making combined analysis a major undertaking. Detailed site-level coordination also presents operational challenges in schedule implementation. With human populations increasing along with per capita income, more demands are being placed on forest resources than ever before. Effective forest management strategies are desirable and involve trade-off decisions regarding multiple objectives for managing forest ecosystems. Site-level spatial considerations are challenging to address in forest planning because of the substantial detail involved, often relating to the distribution of forest patch sizes and patch shapes across large landscapes that can change substantially over time. Restoration of large forested landscapes requires developing approaches that account for patterns of ownership and management (Lindenmayer and Franklin 2002). The objective of this research is to investigate the potential gains from detailed, coordinated forest management planning in a large area of northern Minnesota involving two large public ownerships. Both of these ownerships have invested heavily in forest planning using detailed optimization modeling, yet little has been done to coordinate their analyses and resulting forest plans. The intent is to better understand potential gains from combined spatially-explicit forest analyses and planning. As part of this research, an existing technique for addressing spatial interdependencies was refined and then applied in conjunction with an aspatial forest management scheduling model. Coordinating management across large public ownerships is a concern throughout much of the US. Twenty four states in the US have more than a million ha of public forest land, and all of these states have at least two public ownerships managing nearly 200,000 ha (Oswalt et al. 2018). Although each public land management agency manages their forest for public benefits, their forest management goals can be different, and each needs to follow different laws or regulations. Inter-owner coordination could potentially help them better achieve overall public forest land management objectives for a region. Edge effects refer to the gradients in abiotic and biotic factors that exist when two different types of ecosystems or habitats abut one another. Abiotic factors include light intensity, air temperature, relative humidity, soil moisture, and litter moisture (Matlack 1994). Additional abiotic factors are soil temperature, wind speed, and vapor pressure deficit. Biotic factors include vegetation, mammalian, avian, and arthropodan abundance and structure. There is a general consensus within the literature regarding types of abiotic gradients that exist near edges. As reviewed by Fraver (1994), forest edges normally have greater light intensities (Oosting and Kramer 1946; Kapos 1989; Brothers and Spingarn 1992), increased air temperatures (Kapos 1989; Williams-Linera 1990), increased soil temperatures (Brothers and Spingarn 1992), lower soil moistures (Oosting and Kramer 1946; Kapos 1989), and lower relative humidity. Gehlhausen et al. (2000) found similar results for abiotic gradients when reviewing the literature. Gehlhausen et al. (2000) indicate vegetation edge effects might extend as far as 100 to 175 m even though microclimate edge effects appear to only reach as far as 40 to 80 m.
Core area is a metric related to the ability of a forest condition to provide functional habitat. The strength and weakness of a core area metric lies in its compromise approach. The modeling of core area is an improvement over maximum harvest block size because it recognizes the value of interior as well as edge habitat on a landscape. Core area does not directly recognize individual species’ habitat requirements. However, the approach has an advantage over explicitly accounting for wildlife dynamics because information on all or many species is not necessary. Patch-size effect refers to the situation where a species’ response to habitat is affected by the amount of habitat that is all connected. In the literature on patch-size effect, species are usually grouped into classes of similar edge response. Commonly in landscape ecology and conservation biology literature, a species’ habitat association is simply categorized as edge, interior, or generalist (Bender et al. 1998). Researchers have investigated the patch-size effect for mammals (Maehr and Cox 1995; Diaz et al. 1999; Mortelliti and Boitani 2008; Frakes et al. 2015), birds (Schieck et al. 1995; Rosenberg et al. 1999; Ortega and Capen 2002; Donner et al. 2009) and arthropods (Shure and Phillips 1991; Jokimaki et al. 1998; Normann et al. 2016). A challenge is in determining effective and practical ways to manage fragmentation on the landscape. Forest planners have long recognized the importance of spatial concerns, but capturing such concerns has been a challenge in their work. New computer technologies are helping substantially for practical applications. 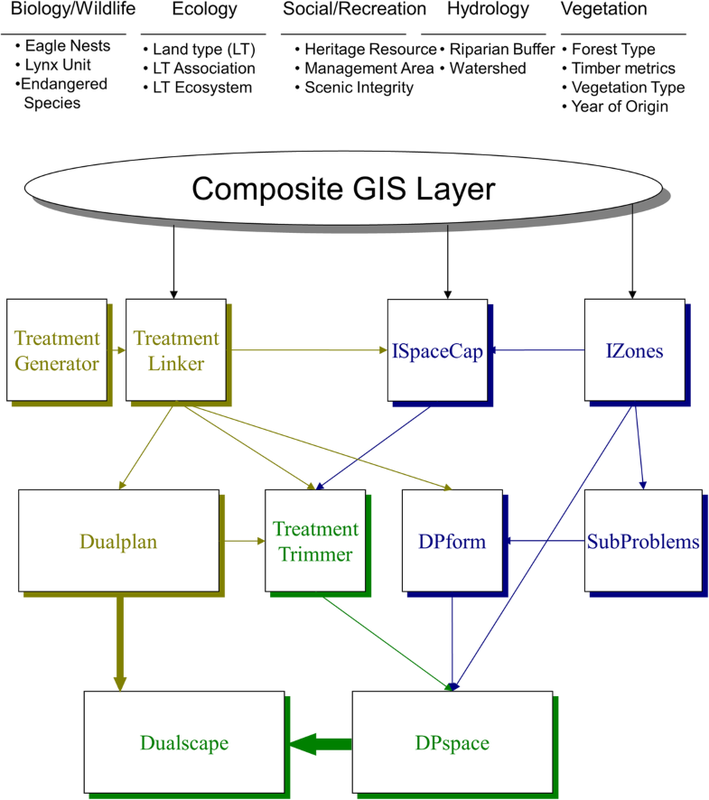 Addressing spatial detail of forest management adds substantial complexity to the modeling process because of the additional information required to determine and track spatial interdependencies between the many analysis units used in applications. The US National Forest Management Act of 1976 calls for “maximum size limits for areas to be cut in one harvest operation” when using clearcutting or other even-aged harvesting systems. This legislation codified into law the concept of maximum harvest block size on National Forest System lands. A consequence of limiting harvest block size is the need for adjacency constraints in analyses for planning. Adjacency constraints recognize spatial conditions of adjacent stands, prohibiting a harvest opening that would be greater than the allowed maximum. Researchers have devoted much attention to incorporating adjacency constraints into forest management scheduling models. Examples are numerous. Review articles compare the efficacy of various approaches (Murray and Church 1995; Baskent and Keles 2005; McDill et al. 2016; Llorente et al. 2017). Planning harvests for stands whose areas are greater than the maximum harvest block size has been a challenge. Apriori splitting of stands can be done systematically (Barrett 1997; Borges and Hoganson 1999; Heinonen et al. 2007; Heinonen and Pukkala 2007). Gustafson and Crow (1994) model the effects of harvest block size on landscape structure and the spatial distribution of cowbird brood parasitism. The impact of cowbird brood parasitism on neotropical migrant forest birds indirectly provides information of the fragmentation of forest interior habitat. Gustafson and Crow’s (1994) research suggests harvest block size limits can lead to fragmentation of interior forest habitat on the landscape, and fragmentation correlates most strongly with decreases in harvest block sizes and increases in harvest volumes. Barrett et al. (1998) investigated the economic and fragmentation effects of harvest block size on a mixed-ownership landscape in the Sierra Nevada of California. Although Barrett et al. (1998) warn of not generalizing their results, their results show that decreases in harvest block size maintain older forest on the landscape but cause fragmentation in the process. Policies that set maximum harvest block sizes do have long-term consequences and the potential exists to fragment essential habitat. In light of this possibility, it is important to consider alternatives to harvest block size limits for managing spatial concerns on landscapes. Another general strategy to address spatial arrangement in forest management scheduling models involves focusing on conditions of the older forest on the landscape, rather than the characteristics of the harvested area. In forest management literature, the metrics core area and interior space are used in representing spatial objectives in these approaches (Hoganson et al. 1998; Öhman and Eriksson 1998; Öhman 2000; Hoganson et al. 2005; Hoganson et al. 2008; Öhman and Eriksson 2010). A recent literature review provides a good overview of these approaches and recent applications (Llorente et al. 2017). All of these studies seek to maintain or increase the amount of older forest on the landscape by recognizing the impacts of edge created by either landscape features (e.g., road networks, permanent openings, etc.) or management activities (e.g., harvesting operations). Kurtilla and Pukkala (2003) look at the opportunity to coordinate forest management planning of individual plans for holdings in Finland to help achieve broader landscape-level wildlife habitat objectives. They utilize an estimated utility function for each ownership and capitalize on the differences between ownerships in terms of their differences in their utility functions. They consider six study areas ranging in size from approximately 400 to 1000 ha with as many as 26 separate holdings. Considering the complexity and size of each problem, they utilize a heuristic search technique that combined simulated annealing with a neighborhood search process to find good solutions. They found large gains in production of core area and larger patches from improved spatial arrangement of harvests with minimal impact on the sum of utility functions over all holdings. Focus of the study was on better understanding the potential of coordinated forest planning between two public landowner agencies in northern Minnesota. These agencies and the general public would like to better understand the production possibilities and associated trade-offs for these public lands for producing both timber and core area of older forest (COF). The study area was comprised of National Forest System (NFS) lands within the Chippewa National Forest and lands managed by the Minnesota Department of Natural Resources that are in Itasca and Cass counties and fall within the proclamation boundary of the Chippewa NF. Approximately 302,300 ha were modeled with 224,600 in federal ownership and 77,700 in state ownership. Figure 1 displays the administration of public lands within the proclamation boundary of the Chippewa National Forest. The mosaic of these two public ownerships shown in Fig. 1 is representative of other areas of northern Minnesota and the US. Three general cases of analyses were considered at a landscape level -- one considered only Minnesota Department of Natural Resources lands, another only National Forest System lands, and a third with both of these two ownerships combined and modeled as one (“Both”). For each of the three modeled test cases, multiple scenarios are analyzed, with each scenario having a different per unit value assumed for core area of older forest (COF). Stakeholders in the region preferred using prices per acre. Fourteen COF values are considered for the “Both” scenarios: $0, $50, $100, $200, $300, $400, $500, $600, $700, $800, $900, $1000, $1300, and $1500 per acre per decade. In terms of value per hectare per decade, these values are approximately $0, $125, $250, $500, $750, $1000, $1250, $1500, $1750, $2000, $2250, $2500, $3250, and $3750. Nine COF value levels are considered for the “Fed” and “State” scenarios: $0, $125, $250, $750, $1250, $1750, $2500, $3250, and $3750 per hectare per decade. More COF values are analyzed for the “Both” scenarios because of the interest in this research to explore trade-offs between timber and COF from coordinated management. For all scenarios, COF is valued at the end of each decade with discounting (4% annual real rate) translating all values to a net present value based on the midpoint year of the first decade. Timber stumpage prices were assumed to be constant over time and equal to average prices used for the most recent forest plan for the Chippewa National Forest (USDA Forest Service 2004). Considerable detail was included in tracking volume and values for the 13 timber product classes. Management cost estimates were those used by the USDA Forest Service in their current forest plan and included sale administration costs, and a wide range of stand establishment and restoration costs that depend on the pre- and post-harvest forest cover type. A 100-year planning horizon was used with ten 10-year planning periods. Stand and sub-stand level polygons were used as the basic modeling unit (analysis unit). Sub-stand polygons were used to recognize both inner and outer riparian buffers. Approximately 92,000 forested polygons were modeled. Important map layers for the analysis included: (1) an ecological layer recognizing seven landscape ecosystems (LEs) (2) a riparian layer with inner and outer riparian areas (3) a management area layer using USDA Forest Service classifications and (4) a visual quality layer identifying two classes of visual corridors along roads and waters. For each analysis area, its forest type, its stand age and its condition in terms of its “color” on each of these map layers impacted the set of treatment options available for the analysis area. Management scheduling models have the potential to consider a wide range of forest-wide constraints. Shadow price estimates for forest-wide constraints were used to recognize these types of considerations. These shadow price estimates were taken from a Dualplan (Hoganson and Rose 1984) application done for the Chippewa National Forest for its most recent forest plan revision. Forest-wide constraints included: (1) specific forest cover type targets for each LE in the region and (2) timber flow constraints to achieve more of an even flow of volume over time. Generally, the forest cover type targets reduce slightly the area in the aspen forest cover type over time and increase the conifer types. The shadow price estimates to produce a more balanced flow of timber over time show a trend in increasing timber values over time, offsetting the older forest age imbalance that would otherwise suggest large yet unsustainable harvest levels in the first decade. Certainly it would be possible to use more shadow price estimates to also consider other forest-wide constraints. For each analysis unit, a large number of silvicultural treatment options are possible. Treatment options are described in pieces, one piece for each rotation This approach of subdividing treatment options is referred to as a Model II formulation (Johnson and Scheurman 1977). For each polygon over the planning horizon, the overall number of unique treatment options is large because of the combinatorial nature of multiple rotations. For the management situation analyzed, forest restoration options that change forest cover type were also considered. Seventeen silvicultural treatment types were considered for the first rotation. Information for these options utilized the data from the USDA Forest Service planning efforts of the Chippewa National Forest (USDA Forest Service 2004). The predominant forest cover type in the study area is aspen, and there is the view by some stakeholders that active management should be done to reduce the area in the aspen cover type. Eight of the silvicultural treatment types were partial cut options for the aspen and aspen-fir types designed specifically for helping accelerate the rate at which aspen cover types might be restored to other cover types. 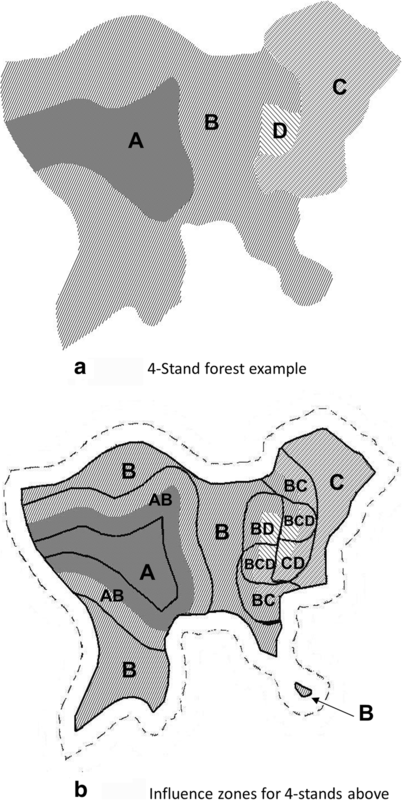 Spatially-explicit forest management modeling is complicated because emphasis shifts to how management decisions for an individual stand (analysis unit) is intertwined with the decisions for nearby stands. Unlike temporal concerns like sustaining timber flows over time, outcomes describing spatial conditions are not separable and additive across all analysis areas. Combinations of options for multiple polygons become a key consideration with emphasis on the spatial interdependencies of the outcome. For example, if 5 polygons all interact with each other and each has a 100 treatment options, then there are 1005 (10 billion) unique ways of managing just those 5 polygons in combination. This study focused on ways of simplifying the number of options for each polygon while looking critically at any simplification to avoid eliminating potentially optimal choices. Next, we provide a brief overview of the modeling components. Influence zones are the underlying mechanism for incorporating spatial dependencies into the programs that constitute the spatial component of this work. Influence zones have been successfully used in modeling adjacency constraints and interior space (Hoganson and Borges 1998; USDA Forest Service 2004; Hoganson et al. 2008). For this research, the use of influence zones in modeling core area of older forest (COF) is refined by recognizing differences in condition requirements for COF and the condition requirements for its surrounding protective buffer. In the context of forest management, an influence zone represents an area of the forest that is influenced, in terms of COF production by the same set of analysis units. COF is an area of land that is completely free of edge effects and meets the specified condition of COF (Fig. 2). Whether a given area on the landscape qualifies as COF depends on two factors: (1) the definition of COF conditions in terms of age of its analysis unit, and (2) the condition of the other analysis units defining the associated influence zone. The size and shape of each influence zone is impacted by the assumed depth of edge influence. Depth of edge influence extends the idea of adjacency and is used in determining whether those parts of the surrounding area not meeting COF conditions create an edge effect on older forest. COF is temporal in addition to being spatial because of changes that occur on the landscape over time. Influence zones simply identify areas that could produce COF. Once influence zones have been identified, each is included in a management scheduling model to explicitly account for and schedule COF production by planning period over the planning horizon. The number and area of influence zones depends upon the spatial layout of stands and the depth of edge buffer distance. Larger buffers will increase the relative importance of interactions involving multiple stands. Each influence zone is defined by the specific set of stands that influence it. Figure 3 shows a map of a simple 4-stand forest and a map of its associated influence zones. Note how each influence zone is not necessarily a contiguous area. For example, influence zone “B” in Fig. 3b is not contiguous. The dimension of each influence zone identifies the number of stands influencing that zone. An influence zone with dimension of 1 represents the part of a stand that could produce COF independent of how other stands are managed. Influence zones present challenges in application over large areas, as their use involves generating a new map layer summarizing spatial interdependencies between the many analysis units (stands or smallest management units). For this study, the model was refined to assume that the required conditions for COF can be different than the required conditions of its surrounding buffer. This makes it necessary to track conditions of the subzones of each influence zone (Fig. 3) to identify when the less restrictive stand age requirements for buffer area may be met by all subzones of an influence zone while only some of those subzones may meet COF age requirements. For most of the LEs in the study area, stand age requirements were 75 years for core area and 35 years for buffer area. Buffer distances were assumed to be either 45 m or 90 m with results for this paper focusing on the 45-m buffer assumption. The Dualplan model is similar to the management scheduling models based on linear programming (Johnson and Scheurman 1977; Hoganson and Rose 1984). The key difference is that Dualplan uses a specialized solution technique based on duality theory to decompose and solve the problem in parts. The decomposition nature makes it relatively easy to recognize many analysis units (stands) in the model. 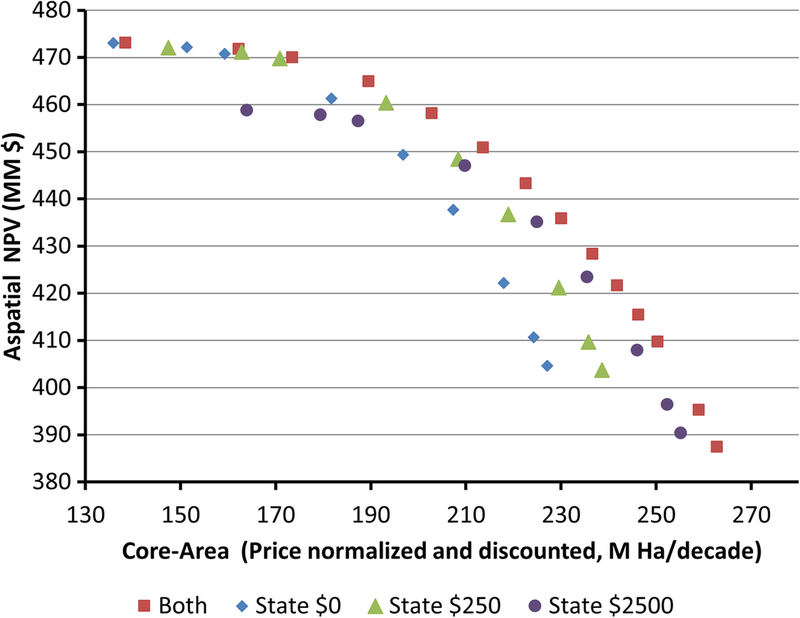 Dualplan uses estimates of the shadow prices for the forest-wide constraints to evaluate and select stand-level treatment options (Paredes and Brodie 1988). Dualplan is iterative; each iteration shadow price estimates are based on summaries of the current model results. Dualplan has been used widely for applications in Minnesota (Hoganson and Borges 2000; Hoganson et al. 2005; Hoganson and Reese 2010; Hoganson 2013; Hoganson et al. 2014). The USDA Forest Service used Dualplan to analyze a range of forest-wide alternatives for the two National Forests in Minnesota (USDA Forest Service 2004). The analyses for the Chippewa National Forest in Minnesota served as a starting point for analyses for this study. Besides constraints on timber production levels, these National Forest applications recognized constraints that: (1) controlled the age distribution of the forest in each LE, (2) described forest restoration objectives for each LE by setting area targets for a range of forest cover types, and (3) related the value of biodiversity values for specific age classes in specific forest cover types to the acres present in that age class in each decade of the planning horizon. This last set of constraints is similar to the concept of downward sloping demand curves for timber where more timber output in a given time period implies a reduction in the per unit price for the timber (Llorente et al. 2018). To value forest-wide aspatial objectives over time, this study used the Dualplan shadow price estimates from one modeling scenario for the current forest plan for the USDA Forest Service planning process for the Chippewa National Forest. The scenario used was one with relative few forest-wide constraints on old forest because an objective of this study was to analyze a wide range of timber harvest levels and production of core area of older forest. In defining objectives one could set aspatial old forest production targets (or goals) or set old forest objectives in terms of prices for COF. Here, the emphasis is on exploring the impact of COF price assumptions on the production of both COF and timber. DPspace, is a model similar to Dualplan in that it decomposes large problems into parts (Hoganson and Borges 1998). It emphasizes spatial arrangement of stands and thus needs to consider site-level interactions with nearby stands. DPspace uses basic moving windows concepts of geographic information systems to look at neighborhoods. DPspace solves dynamic programming (DP) formulations for neighborhoods and uses a set of overlapping moving windows of neighborhoods to examine spatial interdependencies. Figure 4 shows an example of a moving window for the study area. The overlap of the moving windows scheduling process is defined by the portion of the window for which the DP solution is accepted for each window. Portions of the window for which the DP solution is accepted are areas near the portion of the forest yet to be analyzed by the moving windows. Windows are generally much longer than they are wide as it tis the width of the window (in terms of number of stands) that impacts the size of the associated DP formulation. Tests have shown that overall results are not overly sensitive to the window size or model parameters such as window overlap (Wei and Hoganson 2008). It is also noteworthy how results are generally insensitive to the direction and side of the forest in which the scheduling process begins. When the solution process uses different starting points (sides of forest) and different directions of window movement, and then each starting point converges on a nearly identical solution, it seems likely that those solutions are at least near-optimal for the problem as formulated. Each stand in a moving window has a corresponding stage in the DP formulation where its management options are evaluated. COF is valued for an influence zone in the stage of the DP formulation that corresponds with the last stage in the DP formulation that corresponds with a stand that defines (influences) that influence zone. At that point, COF can be evaluated as conditions of the other stands influencing the influence zone are known; each is used as a state descriptor for the DP formulation at the start of the stage (Hoganson and Borges 1998). Addressing the production of COF in the DP network is complicated by the assumption that the buffer area surrounding COF may not need to meet the required age of COF. This is a refinement added to the modeling system during this study. In effect, this addition means that each subzone of each influence zone (subzones defined in terms of the parent stand in which the subzone resides) must be examined separately. The number of influence zones in a forest is generally substantially larger than the number of stands; so a substantial portion of the effort in solving the DP formulations involves the valuing and tracking of COF production. Once each DP formulation is analyzed for a moving window, DPspace traces back through the through the formulation to identify the optimal treatment option for each polygon. This is a straightforward process but complicated by the large size of most DP formulations. Once the optimal solution is identified for a given moving window, DPspace accepts the schedule for that portion of the window that is not to be included in the next moving window. Window overlap between the sub-problems helps overcome potential problems associated with recognizing spatial interactions that would result if one tried to divide the forest into many sub-problems without recognizing the spatial interdependencies that cross sub-problem boundaries. Figure 5 provides an overview of the modeling system and its modular nature. It is beyond the scope of this paper to go into detail on the model components and data layers. In Fig. 5, yellow shadowed modules (left-hand side) are classified as aspatial, blue shadowed modules (right-hand side) as spatial, and green shadowed (bottom) modules as integrated. The Treatment Generator is much like a prescription writer used in forest planning. The Treatment Linker module identifies possible treatment options for each stand considering specific characteristics like those listed at the top of Fig. 5. The Treatment Trimmer integrates spatial and aspatial information to eliminate treat options that can’t possibly be part of an optimal solution. The size of the DP formulations in DPspace can be made smaller, or moving windows can be made larger, if fewer treatment options are needed for some stands. DPform explores alternative DP formulations for each moving window, searching for smaller (more efficient) formulations of the problem as the size of the DP formulation varies with the order in which stands are sequenced in the DP formulation. The Subproblems module divides the forest into subforests that have no spatial interdependencies. Dualscape offers opportunity to re-evaluate the forest-wide problem, addressing impacts of spatial objectives on specific aspatial constraints. For this study, aspatial (timber) constraints are not assumed to be fixed. Instead, emphasis is on better understanding trade-offs between timber and COF production and on potential benefits of combining analyses for the two large public ownerships. Results presented here emphasize a comparison of modeling the two public ownerships separately or in combination, where emphasis in on coordinating management. Throughout this results section, NFS lands are referred to as “Fed” lands and lands managed by the Minnesota DNR are referred to as “State” lands. The term “Both” refers to the situation where both sets of land are analyzed together as one ownership. “Fed”, “State”, and “Both” are the three test cases fully analyzed by the modeling system. A fourth set of outputs is obtained by joining the Fed and State results after modeling; this set is referred to as “Fed+State” scenarios. Understanding the influence zone estimates for the study area will be helpful for understanding the harvest scheduling results. Tables 1 and 2 each provide influence zone estimates for a specific buffer width assumed for COF. These tables help provide insight for each of the four test cases, i.e., three modeled test cases and one derived test case. It is particularly interesting to compare the “Fed+State” columns with the “Both” columns in Tables 1 and 2. Since “Both” combines the two ownerships for a single coordinated analysis, it explicitly considers the interdependencies between stand management decisions for the two ownerships. The influence zones, as estimated for modeling ownerships separately, assume areas influenced by another ownership cannot be controlled directly to produce COF. Therefore, the difference between the values in the “Fed+State” and “Both” columns in Tables 1 and 2 represent the maximum additional area of COF that could be realized from coordinating management for these two ownerships. Close to 62% of forested land for the “Both” scenario can produce COF assuming a 45-m buffer. This drops to 40% if a 90-m buffer is used. For the 45-m buffer, less than 1% of the study area is located in influence zones with a dimension greater than 5. Also, for this buffer distance, over 33% of the total area that can produce core area is influenced only by one stand (Table 1). Not surprising, the 90-m buffer distance has a substantially smaller portion of the influence zone total area with a dimension of one – less than 13% of the total forest area than can produce core area. Also not surprising, Table 2 has more rows than Table 1, reflecting that influence zones with a greater dimension are possible and more common when a wider buffer is used. With a 90-m buffer, less than 1 % of the influence zone area is in zones involving more than 8-way interactions. Influence zone areas in the study area that involve many interactions are typically located in or near riparian areas where small analysis units exist due to riparian buffers. Much can be learned from the influence zone information for a study area about the potential gains from coordinating management to produce COF. For our study area and with a 45-m buffer, the potential area for producing COF increases from 181,953 ha to only 187,870 ha when it is assumed that management of the two ownerships can be modeled together (Table 1). This gain is only about 3.2% of the total area that can potentially produce COF. The gain increases to 6.6% when using a 90-m buffer (Table 2). Although this percentage is larger with the wider (90-m) buffer, the total amount of land available for producing COF drops by approximately 65,700 ha in going from a 45-m to a 90-m buffer (Tables 1 and 2). Tables 1 and 2 also reflect the enormous amount of spatial detail that is modeled for this study. With a 45-ft buffer, there are almost 240,000 influence zones that are addressed individually in the scheduling model. Not only that, but to recognize differences between forest age requirements for COF and for buffer area of COF, each subzone of each influence zone must be identified and addressed separately for each planning period in the scheduling model. Core area of older forest (COF) was tracked by planning period for each of seven LEs. 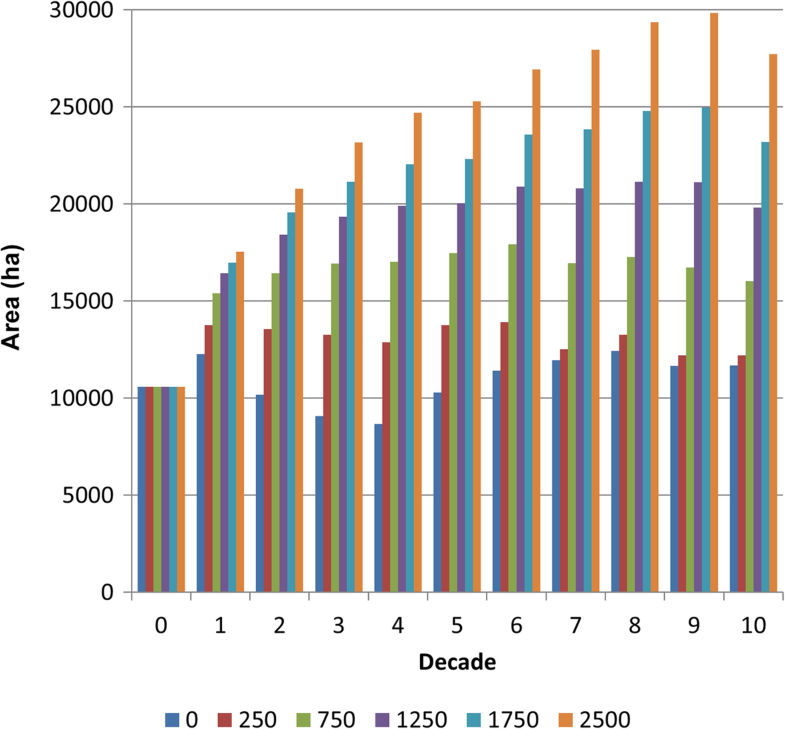 Figure 6 shows COF production by decade for the Dry Mesic Pine Oak LE for the “Both” scenarios that differed only in the assumed value for COF. This LE is the largest upland ecosystem in the study area. A wide range of COF values are compared in Fig. 6. Even with a value of $0 per hectare, the quantity of COF does not decline over the long-term for the Dry Mesic Pine Oak LE, or for any of the other LEs. This result can be explained by two factors. First, the timber harvest levels modeled are sustainable over time; if no harvesting is modeled for the forest, then the amount of COF will increase over time. Second, although much of the forest is generally old initially, COF is not high at the start of the planning horizon. This initial condition reflects the fact that spatial arrangement of the forest, specifically COF, has not been an important management objective in the past. With core area valued and scheduling done to create it, Fig. 6 shows how it can be increased substantially over time. Yet even with very high COF values, it still takes time to adjust management schedules spatially to create larger patches of older forest. And as one would expect, higher values for COF provide higher production levels of COF over time. And also not surprising, there are not large fluctuations in COF levels over time. Basically under the assumptions used in this study, once achieved, large patches of older forest can generally be sustained on the landscape over time. One primary objective of this study is to examine potential gains from modeling two multiple forest ownerships together. Considering the map showing the intertwined ownership for the two public agencies (Fig. 1), the public agencies involved expected large potential gains from combined analyses. Figure 7 shows the total amount of COF produced each period for the combinations of ownership cases that all used a core area price of $1250 per hectare per decade. This price level is an intermediate price level considered. Comparing the results of planning separately (“State+Fed” in Fig. 7) with planning together (“Both” in Fig. 7) shows consistent but small gains in COF production for each of the 10 planning periods. Even at the highest COF price considered, this same result occurred. These results are best explained by the summary of the influence zone information (Tables 1 and 2), showing relatively small proportion of the total forest area that is influenced by both State and Federal forestland. Also of interest from Fig. 7 is the level of COF production by ownership. Generally, both the Fed and State ownerships have substantial area of COF and both have substantial potential to increase COF production over time through detailed spatial planning. The results presented in the previous subsections focus on potential gains from on-the-ground spatial coordination and give the impression there is little to be gained by coordinating forest management across ownerships. The original “Fed+State” results come from combining individual Fed results with individual State results for a given COF value. However, when combining results from the two ownerships using the same COF value, an implicit assumption is made that both ownerships value COF at that same level. In reality, forest planning analyses by the two large public ownerships do little to coordinate management across ownerships for COF objectives. 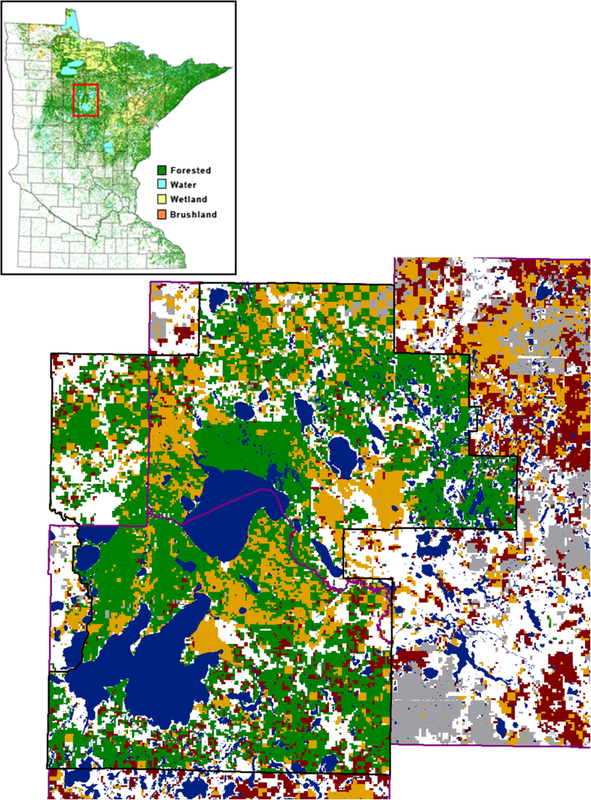 The USFS did schedule COF using this spatial modeling system for analysis to support forest planning for both of Minnesota’s national forests (USDA Forest Service 2004). However, the State of Minnesota does not yet have a history of addressing directly COF production in their forest planning process. An extended set of “Fed+State” results is computed by combining individual Fed results from a range of COF values with individual State results from a range of COF values, thus making the extended results a superset of the original results. In creating the extended “Fed+State” results, it is assumed that each agency can find near-optimal solutions for the assumed COF values through use of the modeling system applied in this study. The extended set thus represents a near-optimal outcome that can be obtained when each agency assumes its own values for COF and manages independently for on-the-ground implementation. 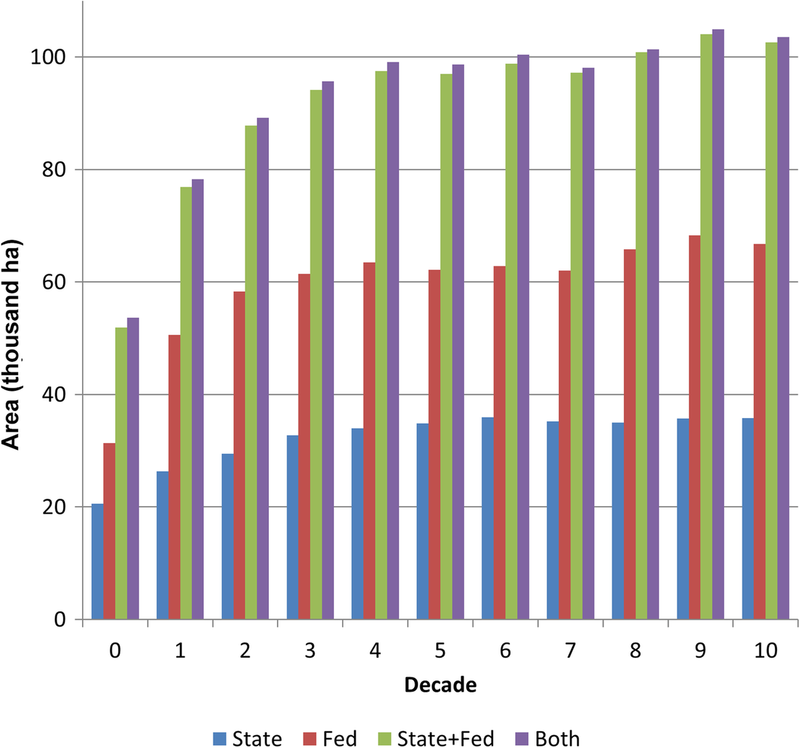 Figures 8, 9 and 10 show the extended “Fed+State” results compared with the “Both” results. 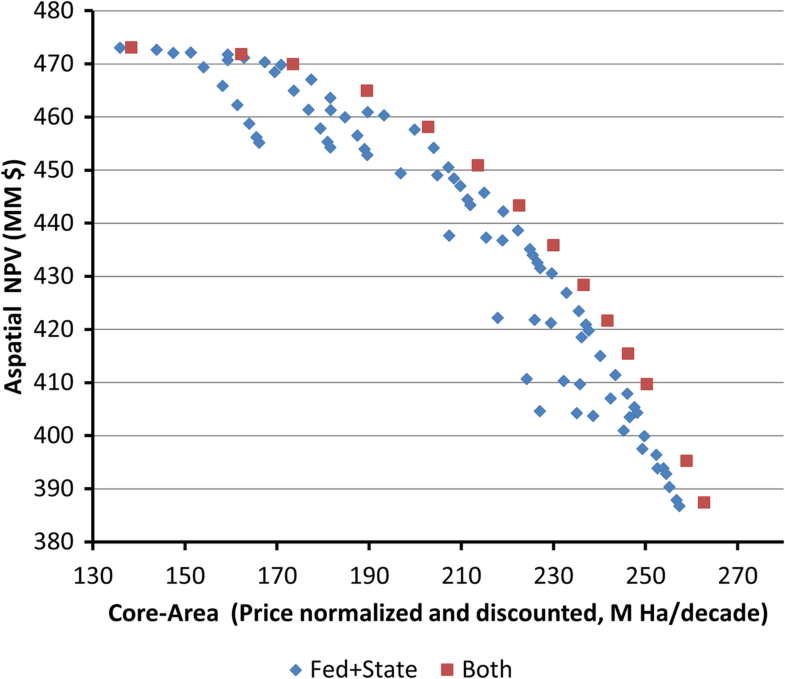 These figures display aspatial NPV (timber benefits) and price-normalized spatial NPV for each combination of COF prices for the Fed and State ownerships. 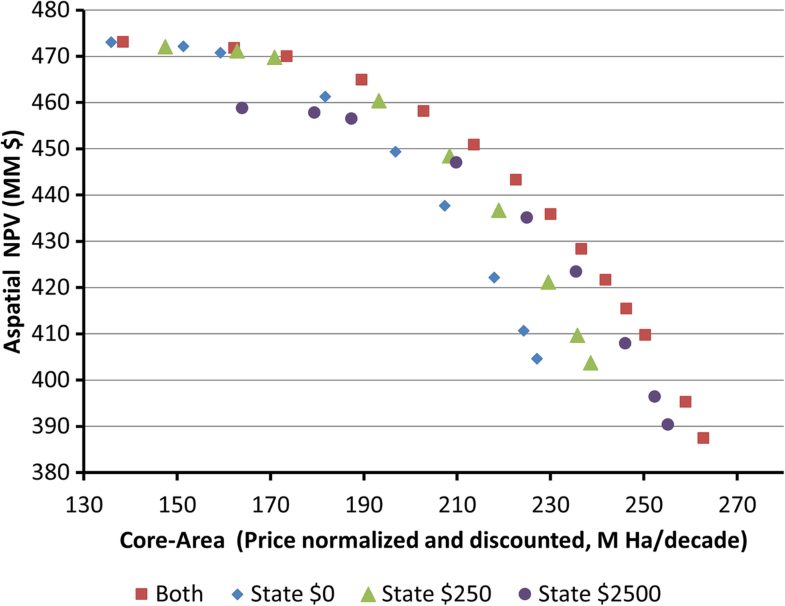 A price-normalized spatial NPV is used to help compare results from different combinations of COF prices for Fed and State and to address timing differences of COF production. 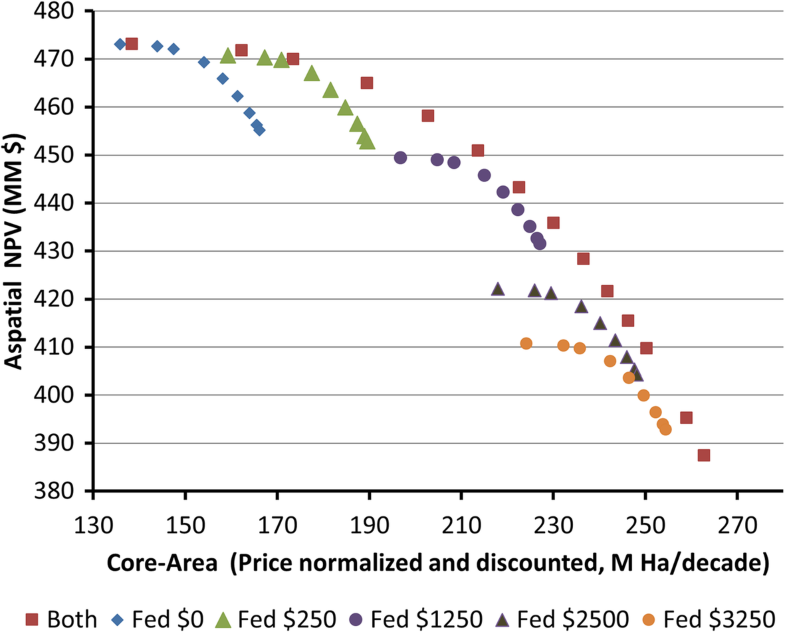 In effect, the price-normalized NPV estimates are based on the assumption that core area values are $1 per hectare per decade, with values credited based on core area levels at the end of each planning period. To adjust the x-axis so it represents NPV estimates based on a different COF price level, the values in the graphs can simply be multiplied by the specific core area price. Figure 8 shows the results from all combinations of value assumptions for Fed and State COF values with the results for the “Both” scenarios. As a whole, the “Both” scenario results estimate the efficient production possibilities frontier from combined analyses. All of the results for the “Fed+State” scenarios are within this frontier, with some well within this frontier, reflecting losses from lack of coordination in COF values. When the aspatial production along the frontier is near its maximum, there are “Fed+State” scenarios that are essentially along this frontier (Fig. 8). In this situation, emphasis is on timber production with little need to coordinate management spatially to produce COF. In contrast, where the production of COF is high, there is a clear gap between the production possibilities frontier formed by the “Both” scenarios and any of the “Fed+State” scenarios. Although this gap may appear small in percentage terms, in absolute terms it could certainly be large, involving millions of dollars, even if the two ownerships are assumed to have used similar core area values for planning. Figure 9 shows the results for all scenarios highlighting scenarios with the same values assumed for COF for the Fed scenarios. The curves fall well short of the production possibilities frontier, especially when assumed values for the State are clearly different from the values assumed for the Fed. For example, for the situation with a value of $0 per ha per decade, the results are well within the frontier for the portion of the frontier where COF production is highest. Generally, by fixing the COF value for the Fed lands, the overall production possibilities curve would change dramatically from the frontier for the “Both” scenario. Generally, forest industry groups in Minnesota are likely to be concerned about the US Forest Service setting their COF value to a high value which would substantially reduce timber production potential for the study area. Figure 10 shows the results for all scenarios highlighting scenarios with the same values assumed for COF for the State lands. These curves too are also generally well within the production possibilities frontier for the “Both” scenarios. Assumed values for the State have clearly a smaller reduction in the implied frontier, as the State has substantially fewer hectares in the study area and a higher proportion of the State lands are in lowland ecosystems that are less valuable for timber production. For the situation with a value of $0 per ha per decade, the results are well within the frontier for the “Both” Scenarios especially for the portion of the frontier where COF production is highest. Environmental groups are generally concerned that COF is under-valued for State lands as compared to values assumed for Fed lands. For Fed lands, COF was addressed directly in their forest planning process in Minnesota (USDA Forest Service 2004). Results demonstrate the ability to incorporate detailed site-level spatial into management scheduling models for broad, landscape-level planning. For this study and the assumed COF definitions, substantially larger gains are possible by coordinating COF value assumptions across ownerships, as compared to possible gains from coordinating actual on-the-ground management activities in areas involving multiple ownerships. This has enormous practical ramifications as planning processes by large public agencies are complex with it a major and questionable task to undertake detailed modeling efforts jointly. It would seem much more doable to coordinate modeling assumptions that each use to address spatial considerations. Also, from a practical operational level, needing to coordinate implementation and timing would likely be challenging for specific on-the-ground activities. Data requirements for the analyses were large. Without utilizing information from the USDA Forest Service planning efforts, this study would not have been possible. It is also not a simple task to generate a map of influence zones for a large study area. However, the influence zone information is extremely helpful for understanding results, and once generated, it can be used for modeling many scenarios. It was somewhat unexpected to find so few influence zones involving both ownerships. Reviews of the data found ownership boundaries often following boundaries involving features other than boundaries separating directly the timberlands of the two large ownerships. Buffer requirements for surrounding COF can likely be substantially less restrictive than the requirements for COF. This has clear appeal for integrating timber and COF production. Yet spatial definitions for COF are clearly subjective and recognizing less restrictive requirements for just the buffer area of COF add substantially to the detail of the dynamic programming formulations. However, the increase in computation was not an issue. The increase in computation time is generally linear in nature when a decomposition approach is utilized, as was used in this study. 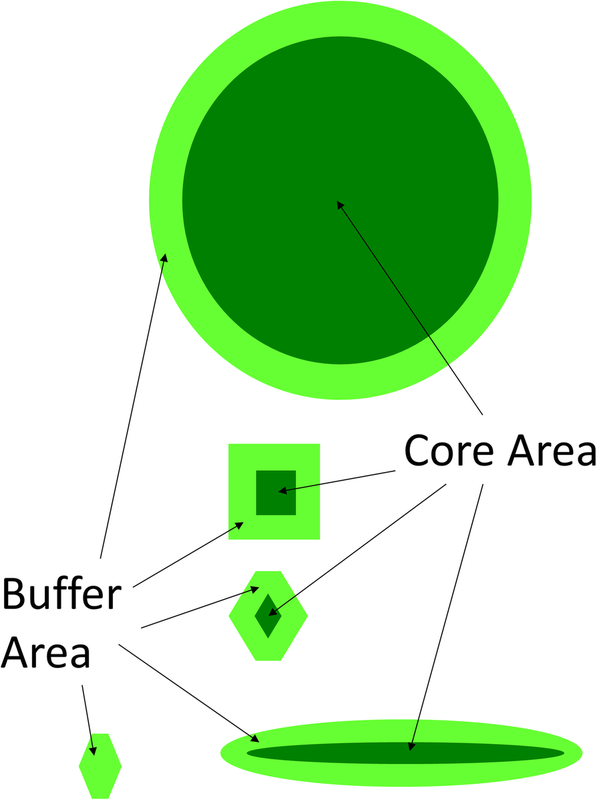 We considered alternative definitions of core area in terms of buffer area, but we did not try considering multiple definitions /types of core area in a single model run. That might not be as complicated as some might expect, as the size of the model formulation would be driven primarily by a formulation involving the widest buffer distance. This study was complicated by the large number of polygons recognized to address riparian areas. This resulted in substantially more influence zones plus those influence zones were of greater dimension which adds to model size. These higher-dimensioned influence zones were generally very small in size. Our recommendation would be to simplify to not recognize this level of detail, much like that suggested by Wei and Hoganson (2008). It would seem desirable to address riparian areas within stands (analysis units) and develop strategies to recognize riparian management within the prescription writer used for developing stand-level treatment options. This would make estimates for future stand yields somewhat more complicated because of increased variability of tree ages within stands, yet plans are likely to be revised well before completing a next full rotation for most if not all stands. It is also important to recognize that core area is only one facet important for environmental objectives. Simpler approaches using proximity constraints (Llorente et al. 2017) may be adequate in at least some situations. The approach used in this study to schedule COF production could almost certainly be used in combination with proximity constraints. Potential losses from lack of coordination as estimated in this study are based on the assumption that each ownership takes advantage of planning tools like those used here to help develop site-specific plans that explicitly recognize spatial objectives and spatial detail. The USDA Forest Service in Minnesota has used these tools in developing their current forest plans in Minnesota. However, relatively few large public agencies throughout the world are likely yet recognizing the spatial detail addressed in this study. Historically, forest management has focused on temporal aspects of management generally involving or targeting concepts of a regulated forest. Spatial aspects of management have been challenging because of the many stand-level spatial interdependencies as highlighted through interdependencies portrayed in the influence zone information. From a modeling perspective, although it cannot be proven that the modeling system used in this study finds optimal solutions, results consistently aligned such that any losses in optimality seem very small compared to impacts of other assumptions such as the value to assume for COF or the appropriate buffer distance to assume for COF. A key strength of the modeling system is its ability to decompose the problem and solve it in parts. This allows for substantially more detail than can likely be included in an optimization model that cannot decompose the problem to solve it in parts. The decomposition nature associated of the solution process will also almost certainly fit well within current advancements in computer technologies related to parallel processing. Generally, it is substantially less expensive to add co-processors to personal computers than it is to increase the speed of a single co-processor. It is now relatively inexpensive to have personal computers with ten or more co-processors. This study did not address the challenges associated with coordinating COF value decisions for large public agencies. It is certainly questionable as to what extent public agencies might forego income returns from timber harvesting of their lands to help achieve broader landscape-level objectives. Yet large public agencies managing forestland in a region have stakeholder groups in common. At least in the US, the general public is often critical as to whether public agencies are working well together to help achieve broad regional objectives. The USDA Forest Service emphasizes its desire to work with local communities to help balance environmental and sustainable economic development opportunities as well as help balance local and national objectives. The USDA Forest Service’s Good Neighbor Authority is a good example that is important and applied nationwide (USDA Forest Service, 2004). The Minnesota Forest Resources Council was created to develop policy recommendations to encourage the adoption of sustainable forest management policies. They helped support this study and are currently working with the USDA Forest Service to further explore coordinated forest management planning in Minnesota involving state, county and federal ownerships (Minnesota Forest Resources Council 2018). This research helps illuminate how forest planning might be better coordinated by public agencies managing large areas of public forestland in a region. Results suggest that gains may be substantially larger by coordinating value assumptions for spatial conditions as compared to combined detailed analysis addressing all public lands simultaneously. This coordination can help capitalize on inherent qualities of sites for specific spatial objectives that depend little if at all on the specific forest ownership. Furthermore, for situations involving coordination of large public ownerships, gains in production of COF may not be as large as expected from coordinating on-the-ground management, and such gains would likely present major operational challenges and costs. Summaries of a map of influence zones may be extremely helpful in better understanding potential gains from coordinating management on-the-ground. If the area of the forest is small that is in influence zones involving two or more ownerships, then the benefits of on-the-ground coordination for core area production would be small. Like with traditional forest regulation methods focused on creating a desirable mix of stand ages, results show that it also takes time to achieve desired future spatial conditions. Even though the forest for the study area is relatively old initially, the potential large gains in COF over time reflect the lack of spatial consideration recognized in past forest planning efforts. Fortunately, with detailed spatial analyses and planning, large spatial gains are potentially likely, with it important to understand trade-offs between timber and COF production, as can be examined by modeling multiple scenarios. This study also demonstrates potential to address differences between COF and the requirements for its protective buffer area. Data sources used in this study (plots, maps, archives) were collected, managed, and synthesized by the faculty and staff of the University of Minnesota North Central Research and Outreach Center in Grand Rapids, Minnesota. The authors thank the Minnesota Department of Natural Resources and the USDA Forest Service Chippewa National Forest for the detailed forest inventory data and associated GIS maps. The project is part of the ongoing forestry research program of the University of Minnesota North Central Research and Outreach Center and the Interagency Information Cooperative of the Department of Forest Resources Department of the University of Minnesota. This study was funded jointly by the Minnesota Forest Resources Council, the University of Minnesota North Central Research and Outreach Center and the Interagency Information Cooperative of the Department of Forest Resources, University of Minnesota. The data and computer models used in this study are quite extensive and were developed over a number of years. While it is consequently impossible for us to provide this data directly, where possible, we will reference researchers to the data sources utilized. JB, HH and YW designed the research. JB developed the spatial interdependency information. JB and HH developed the landscape planning analyses. JB and HH prepared the manuscript with input from YW. All authors read and approved the final manuscript. All of authors are experts in operations research and experienced in multiple objective landscape resource assessment for forest management. JB and YW have strong skills in GIS.